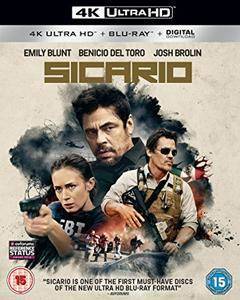 A young female FBI agent joins a secret CIA operation to take down a Mexican cartel boss, a job that ends up pushing her ethical and moral values to the limit. Sicario is a gauntlet of sorts, and some viewers may feel very much like Kate herself (no doubt an intentional strategy), lost in a maelstrom where it's hard to separate the good guys (or gals) from the bad. This new 4K UHD release offers a substantial uptick in video quality despite the fact that the film doesn't have the typical "wow" factors that many videophiles tend to opt for when checking out a new format. The disc's Atmos audio is also outstanding. BEFORE YOU DOWNLOAD: Please make sure by searching the Internet that you have minimum system requirements to play H265/HEVC 4K video files. I've tested all my compressed files in a 3rd Gen Intel Core i3 @ 3.4 GHz machine with 8GB of RAM and 1GB DDR3 AMD Graphics card. All played just fine.